Robin Becker’s newest book, The Black Bear Inside Me, is not easily classifiable at first glance. It investigates a wide range subjects—the death of a dog, the FBI questioning Becker about security clearance for a student, a summer in Provincetown—however, it becomes clear that the collection is inextricably tied to one theme: loss and how loss quietly becomes a backdrop for almost everything. On first read, it is Becker’s language that sings forth; it belongs simultaneously to the gritty, earthy, day-to-day and the elusive, abstract emotions that life can engender. This allows Becker to see the world with a keen, intense eye that refuses to look away from or simplify the complexities of living in 21st-century America. From this larger context, Becker reaches beautifully toward timeless subjects: loss, friendship, and memory. The mother becomes the bird but the loss also becomes the bird, and the shock of the loss becomes the shock of being, suddenly, in air. In Becker’s experienced hands, the lives of animals become a sixth or seventh sense embodied in the speaker, not just an objective correlative. This overwhelming sense not only of love but of utter awareness and atunement is what will bring me, and I imagine many readers, back to Robin Becker’s The Black Bear Inside Me again and again. Bsided: For you, what place in the manuscript as a whole does “Semblance” occupy? RB: In the poem “Semblance,” I yoke the experiences of an old man & an old dog, attempting to convey the speaker’s complex love for both. While many poems in the book take up the human being/creature connection, in “Semblance,” the two merge. Compassion and empathy for the self and the “other” occupy a central place. Bsided: Is there another poem from the manuscript you wish you could see Broadsided? Why? RB: The title poem, “The Black Bear Inside Me,” offers a pithy, vivid opportunity for a visual artist to explore animal imagery. I’d love to see that one Broadsided. 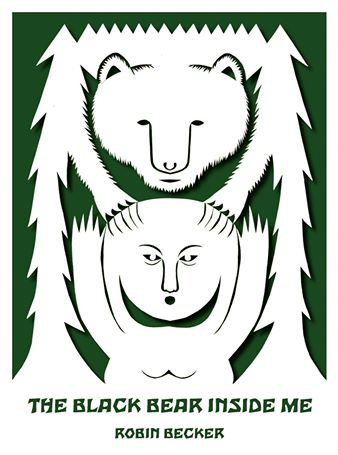 Bsided: One of the aspects of The Black Bear Inside Me I found particularly remarkable was the range of subjects the poems cover. Can you talk about that a bit? 5) how the past lives on in memories. Yes, there are some “outliers,” but many poems fall under the clusters I name.